The answer to the above question is: I blooming well hope so! The strike was so big that it caused a minor earthquake! Missile strikes against Syrian regime forces in the central province of Hama overnight killed 26 pro-regime fighters, mostly Iranians, a monitor said Monday. The Syrian Observatory of Human Rights said the fighters had been killed in a raid, “probably” carried out by Israel, on the 47th Brigade base in Hama. “Given the nature of the target, it is likely to have been an Israeli strike,” he said, adding that strikes also hit an air base in nearby Aleppo province where surface-to-surface missiles were stored. While some sources blamed Israel for the strikes, Syrian state-owned news site Tishreen said late Sunday the raids were carried out by United States and British forces. The Western troops launched nine ballistic missiles from military bases in northern Jordan that struck Syrian bases near Aleppo and Hama, the news outlet said on its Facebook page. Other media outlets claimed the attacks were carried out by aircraft bombers, and Hezbollah-linked sources and other regime outlets attributed the strikes to Israel. There was no official statement from the US or Britain about the attack. As a rule, the Israeli Air Force does not comment on its activities abroad. Israel’s Intelligence Minister Israel Katz told Army Radio on Monday morning that he was “not aware” of the latest strikes. Videos of the blast show a fireball light up the night sky. The Hama facility was said to house a weapons depot, which accounted for the size and intensity of the blast, which could be seen from kilometers away and reportedly registered on seismographs in the area. 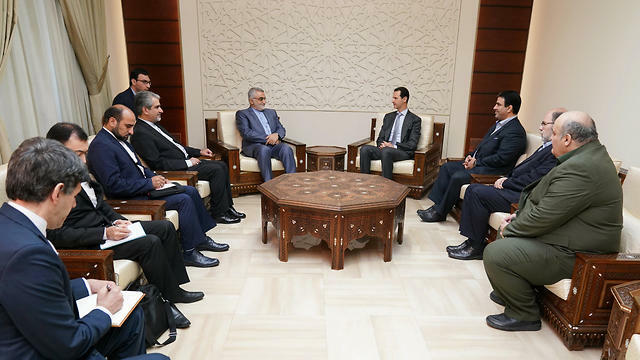 The Orient news outlet noted that the base was known to be the headquarters of Iranian militiamen and had been “heavily involved” in attacks against rebel forces in the area. Earlier this month, seven Iranian military personnel were killed in an airstrike on Syria’s T4 air base in Homs. Syria, Iran and Russia blamed Israel for that attack. Israel did not confirm or deny it. Syrian based reports say that more than 200 missiles were destroyed in the blast. The base that was attacked in the Hama area belongs to the 47th Brigade of President Bashar Assad’s Syrian Army, but apparently there were many Shiites and/or Iranians in the area. … Whatever the case, it is clear that the strike was highly unusual in several respects. Second, not only is the attacking force not rushing to take responsibility, but those who are being attacked are not hurrying to assign blame. Indeed, one newspaper associated with the Assad regime, Tishreen, has even claimed that the attack was carried out by US and UK forces using ballistic missiles fired from Jordan. This report would appear to be somewhat improbable, but the bottom line is that Damascus, Tehran and even Moscow would seem to be wary at this stage of issuing declarations that might require them to retaliate against Israel, or cause them to appear to be making empty threats in light of Iran’s repeated public promises after the last attack, on T-4, that retaliation against Israel would emphatically follow. All this is beginning to look rather like a coordinated Israeli-American operation to limit Iran’s military activities in Syria — simultaneously conveying the message to Moscow that Russia’s green light for Iran to establish itself militarily in Syria is not acceptable in Jerusalem and Washington. Of most specific relevance, however, is the fact that in less than two weeks the Trump administration will make its decision on whether or not to withdraw from the Iranian nuclear deal. So why did pro-regime accounts spread rumors blaming the Coalition for the strikes? Why did pro-regime media switch from reporting the “aggression” to ignoring it? It appears that because they knew no one could ignore the massive scale of the explosion, there had to be some explanation. It may have been embarrassing for the regime to assert that Israel had been responsible, because then it would have to admit that Russian air defenses were not activated, despite assertions that future strikes would be challenged. This made it easier for pro-regime activists to create a convoluted and complex story blaming the US for strikes from a “new” location near Jordan. But by the morning, such necessities to blame the US for the strike evaporated into a decision to simply move on. There are still dozens of killed and wounded at the Hama base. Details of their condition and the base itself have yet to emerge. “They know if they enter military conflict with Iran, they will be hit multiple times,” he said in comments during a meeting with workers, according to his website. He did not specifically refer to the latest attack in Syria, which claimed the lives of at least 26 people—most of whom were Iranians. Khamenei also hit out at the United States a day after new Secretary of State Mike Pompeo visited Riyadh, accusing Washington of trying to stoke a “regional crisis” by provoking its ally Saudi Arabia to confront Tehran. Khamenei’s remarks were aired a day after Pompeo met Saudi King Salman in Riyadh on a flying visit to the region. Pompeo said on Sunday during his visit to Israel that the United States was deeply concerned by Iran’s “destabilizing and malign activities” in the Middle East. Since Donald Trump came to power and with the collapse of all Obama-era agreements in the Middle East all the old alliances are shifting and realigning. On the one hand this makes for very interesting if unusual political bed-fellows, with Saudi Arabia aligning itself with the West and even Israel. Donald Trump is considering abandoning the nuclear deal with Iran which will reshuffle the regional cards in possibly a very dramatic way. Russia seems to be playing a double game, supporting Assad, acting neutrally towards Iran while not overtly supporting it, and yet taking heed of Israel’s position and not overtly threatening Israel. It seems that Russia wants to have its cake and eat it. They want to have their warm-water sea-port and don’t mind if Assad kills his entire people as long as they can have their own little power base. But they are wary of Iran’s ambitions even though Iran is itself supporting Assad. Yet on the third hand they understand Israel’s position even though some of their actions undermine us. The extreme volatility of the region is cause for extreme vigilance, especially for Israel. This entry was posted in Defence and Military, Iran, Mideast news and tagged airstrike, Iran, Mike Pompeo, missiles, nuclear deal, Russia, Saudi Arabia, Syria. Bookmark the permalink. 20 Responses to Huge missile strike on Syria: did Israel do it? Looks like whoever did it used bunker-buster bombs, to destroy munitions stored in underground bunkers, hence the small earthquake measured. If so, this may well be a deliberately timed message to Iran on the eve of Trump leaving the Treaty. Yes that is one of the theories. But the question still remains, whodunnit? America or Israel? Either of them is a possibility. The video is a visual metaphor for Obama’s “legacy”; he, Powers, Rice, Rhodes and Lurch must have had a collective brain aneurysm watching realpolitik played out in the ME in 2018. Do you really think they care? I don’t think they were strongly enough invested in the whole issue. They just wanted to make a deal and metaphorically “take the money and run”. They just wanted to leave a “legacy” and let all of us deal with the terrible outcome. Until their names are dragged through the mud they will never show remorse, I’m willing to bet. A bunker-buster (GBU-43/B MOAB or whatever) could have been used, but it would not be necessary if intelligence could follow a new shipment of explosive weaponry, timing an attack during its journey to underground storage. These shipments of Iranian weaponry, paid for with the $150 billion Obama sent Iran (sorry for the cheap editorializing), can be tracked. 1. Message 1 to Iran, we know EVERYTHING there is to know about your nuclear program, including the weak, vulnerable spots in your underground bunkers, eg: the necessary air intakes. 2. Message 2 to Iran – We have demonstrated we have the munitions that can destroy these bunkers. 3. Message 3 to Iran – We possess the required determination and courage to deal with you. 4. Message 4 to Iran – We will continue to “provoke” you in Syria, and any counter attack by you will lead to attacks on your soil – see Message No 1 above. 5. Message to EU and Russia, if you don’t get onside with Trump, we now have means and intelligence to attack Iran, and have made the necessary political decision. If you oppose Trump, expect us to make sure you are dragged into a full scale regional war, that will threaten your oil supplies and cause hyperinflation. 6. Message to Trump – Israel is doing its bit, now you do yours. 7. Message to Israeli Police and Attorney General – Leave me alone while I deal with this, there is no-one else who has the experience and gravitas to handle this situation internationally. 8. Message to Coalition Partners – This is the Great Game. Do not waste political energies on “small” squabbles. 9. Message to Saudi Arabia. We are fighting your fight. Don’t side track us with Palestinian peace initiatives now, which are just wasteful diversions. This is fantastic news! The kind that gives me a warm fuzzy feeling inside. 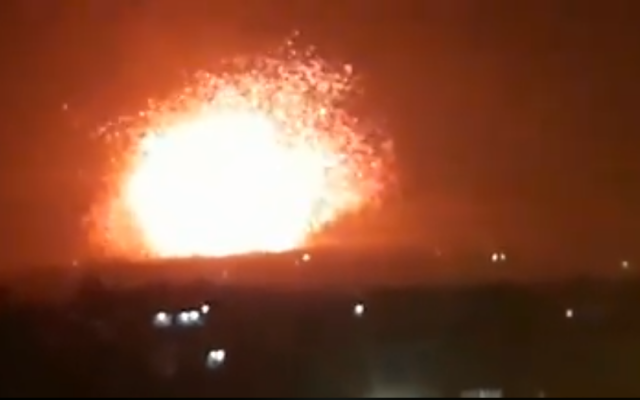 Blowing up Iranian weapon depots is always a good thing regardless of who does it but it’s especially good when Israel does it. G-d Bless Israel! Ah, but we don’t know for sure that Israel did it. It’s nice to think so. I heard on the radio this morning – that in order to cause an earthquake of 2.5, one ‘only’ needs about 500KG of explosives – (corroborated here https://www.easycalculation.com/other/earthquake-magnitude-tnt-explosion.php) – which would seem to mean it was only a small bomb / missile that caused the explosion – just well hit and timed. “only” 500 kg?! That’s pretty big I would have thought. But it’s not only the size, it’s that it was probably a bunker buster. We’re never going to know for sure anyway. It’s just fun speculating. well done to whoever struck the arms depot! 1) Trump, who is receiving accolades reserved for Nobel laureates from Moon Jae-in, now wants to do the second “Deal of the Century.” He knows the Palestinians and Iranians are the obstacles to peace, and this won’t change if they think they can still win their war because Iran is financing terrorists everywhere (particularly Hezbollah). 2) Netanyahu will not allow Israel to commit suicide and will attack Iran in Syria at will. 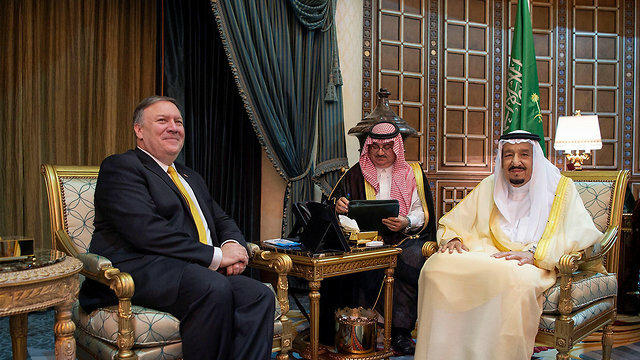 Just before the attack, he received the green light to do so from Mike Pompeo, who met with Netanyahu right after his confirmation (before going to his office). Note: This was reported by DEBKAfile. 3) Iran cannot afford a long war with Israel or anyone else given its banking system is in ruins (lending has mostly stopped). Iran does not want an all-out war because it is too easy to defeat. Twenty missiles could take out enough of Iran’s water supply to bring it to its knees. Israel does not want to hurt the Iranian people and is trying to avoid this option. Therefore, Iran is fighting a war of attrition against Israel, and Israel is stopping it by bombing Iranian bases and targeting its money. 4) Russia cannot protect the Iranian bases in Syria because Israel intelligence and electronics are too good. The Israeli “Units” rock. 5) Trump wants his peace plan unveiled right after the Jerusalem embassy opens. 6) The Crown Prince want the peace plan–a lot of it consists of ideas from him–accepted by the Palestinians, who will reject it because Abbas still believe Israel can be defeated. MBS hates Iran for the obvious reasons. 7) The Crown Prince is telling people he wants the Palestinians to accept the peace plan or to shut up. He is sensitizing the world as to what is coming. 8) The peace plan will be too good to refuse but Abbas will reject it anyway, still hoping to defeat Israel. Gaza gets a massive port, Egypt gives up land in the Sinai to extend the strip, the USA builds some housing, etc. Everyone wins except those who want every Jew dead. The promoters of the peace plan will have to bypass Abbas and go directly to the Palestinians. 9) If the peace plan is to work, the Palestinians have to stop thinking they can win a war with Israel. To do this Iran (Hezbollah) and Hamas must be stopped. Impossible? No. Therefore, Israel (with Trump’s backing) will continue to bomb Iranian assets in Syria. Trump and the Crown Prince want their peace plan to work and they will not allow Iran to get in the way. Excellent. I’d only add (perhaps to (3 ), a few hours and Kharg Island is a smoking ruin, as would be the Iranian economy. Henry and Earl: Very good comments and analysis, especially taken together with Bibi’s speech on Monday night. See my next post for more.